Elvira Leite, Queremos uma Sala Para Trabalhar (We want a room to work), 1977. Original vintage C-type print. Photo courtesy of the artist. NEW YORK, NY – March 6, 2019 — Baruch College’s Mishkin Gallery presents Pedagogy of the Streets: Porto 1977, an historic exhibition that revisits the creative and civic-minded projects conceived and implemented by artist Elvira Leite in Porto, Portugal in 1977. The exhibition will be available for viewing from March 13 – May 9, 2019 and has been curated by Lúcia Almeida Matos and Susana Lourenço Marques (Faculty of Fine Arts, University of Porto). 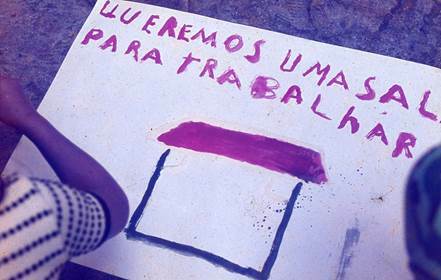 Pedagogy of the Streets: Porto 1977 is comprised of photographs taken by Leite that document various phases of her 1977 collaboration with the children of Porto’s Pena Ventosa community. The images reveal children’s attitudes towards public space and the development of experimental teaching methodologies that resonated throughout Leite’s life. Before “social practice” became a popular term in art circles, Leite was developing a form of artistic engagement that emmeshed social discourse, civic engagement and aesthetic play all together. This exhibition also includes archival materials regarding the local housing support program (SAAL). In the early 1970’s, Portugal faced a dramatic housing shortage. One of the first measures implemented after the Carnation Revolution of 1974 was establishing an alternative housing policy, the SAAL, which promoted collective processes of design, construction and management. Although short lived, the program emphasized the socialization of housing, shunning individual endeavors and encouraging collectivity. Many artists, including Leite, were inspired by the hope of creating better living conditions while maintaining strong ties to their community. For a brief but explosively creative year after the dissolution of SAAL, the streets of Porto became a place for art, participation, and discourse for and by children. Long regarded as an unsanitary working-class neighborhood in the city center, art was not a priority for many of these families. Leite’s project, in turn, encouraged the children of Pena Ventosa to participate in their communities by integrating their personal interests with their living context. This led to a new sense of pride, agency, and affirmation in the participation of designing their own civic experiences through art. Maria Elvira Vieira Pereira Leite, born 1936, graduated from Escola Superior de Belas Artes do Porto (ESBAP) in 1964. Albeit her early artistic success, she went back to school to graduate with a teaching degree and continued her career as a high school teacher. From 1976 on, she dedicated herself to several activities of cultural diffusion. Some of the notable accomplishments included being a consultant for UNESCO teaching art in Portuguese-speaking countries; being invited by the Portuguese government to plan and coordinate art programs for Portuguese women emigrants in other European countries; serving as a fellow of the Fundação Calouste Gulbenkian and creating arts educational materials; and acting as consultant of the Museu Nacional Soares dos Reis, of the Regional Traditional Arts Centre and of the Educational Service of the Fundação de Serralves. Pedagogy of the Streets: Porto 1977 is based on the exhibition Quem te ensinou? — ninguém curated by Lúcia Almeida Matos and Susana Lourenço Marques and presented at Faculdade de Belas Artes da Universidade do Porto in 2016. The exhibition is supported by the University of Porto, Calouste Gulbenkian Foundation and by Baruch College and the Weissman School of Arts and Sciences. Gallery hours: Monday, Tuesday, Wednesday, and Friday from 11:00 a.m. to 6:00 p.m., and Thursday from 11:00 a.m. to 7:00 p.m.